Organum Vivum – a interspecies interface from Paul Seidler on Vimeo. Your next digital interface might be grown, not made. Organam Vivum drops the usual combinations of knobs and hard surfaces and wires for something organic – an “interspecies” interface. The sensors are grown from bacteria, formed into alien-looking, futuristic materials and a mask. 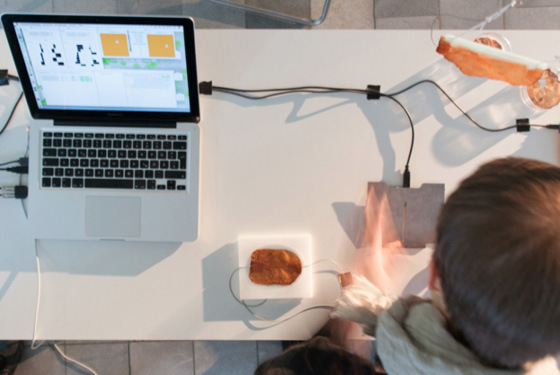 The bio-interfacing project began as a collaboration between Aliisa Talja (who has a background in industrial design) with Paul Seidler at the CDM-hosted MusicMakers Hacklab at CTM Festival earlier this year. Not only are the materials literally organic, but in touching and breathing into these delicate constructions, your interactions themselves become unpredictable. 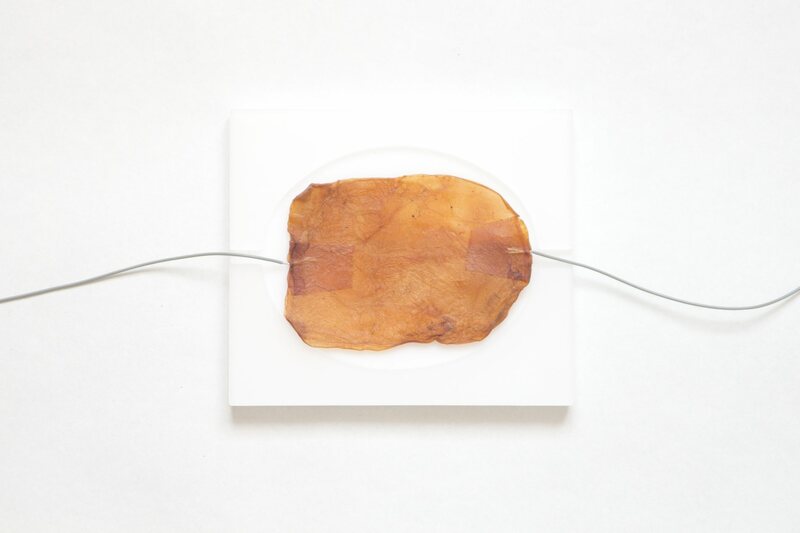 This is bacterial cellulose, routed into a computer via Leslie Garcia’s open source PulsumOSC library. (Leslie was the co-facilitator for this year’s lab; find her OpenFrameworks code on GitHub.) SuperCollider produces the sound, with Arduino providing the interface. Since the hacklab, the project has been steadily growing (so to speak), and Aliisa sends along the latest documentation from her and Paul. The results may seem strange and alien, but that’s perhaps part of the point. This is speculative work that exposes the tension between interface and user, material and sonification. But in doing so, it also reveals some of what may happen as we open up fabrication and design to new realms, beyond just the oft-trod paths of our petro-chemical world in the peak of the cheap oil age. And watching Paul and Aliisa embrace the ritual of playing it is entrancing. More details below of their process. Organum Vivum is an interspecies interface advantaging the characteristics of organic material as well as exploring the possibilities of combining natural and build organisms in sound synthesis. Bacterial cellulose items, working as sensors, are translating our direct interaction with them into a soundscape controllable with touch and breath. In order to communicate in human level through the instrument we’ll have to be aware of the behaviour of a natural material and it’s, sometimes unpredictable, responses to our actions. The result is a sonification of direct interspecies interaction between a human and a micro organism. Bacterial cellulose is an organic compound consisting of certain type of bacteria, which by using glucose creates an envelope around it’s cells thus forming a fine and strong, chemically pure, network structure. We came across it while looking for biomaterials which would be easy to grow without a laboratory environment. By simply making a mixture of black tea and sugar and placing the host culture in the jar we were able to grow several bacterial cellulose pieces of different size then used as sensors in the final setup. The functionality is based on measuring of the conductivity of bacterial cellulose. As an organic material it’s able to absorb and release water and can thus be used as a breath sensor reacting to the humidity of our exhalation. By touching the material we’re bringing our body, our conductivity, as part of the system, which can then be influenced through the increasing and decreasing of the touch area (e.g. stroking, pressing, folding). By varying the the amount of water in every piece we’re also able to control the sensibility of the material. The structure can hold enough liquid to reach the conductivity of water, on the other hand it can be dried up so effectively that the conductivity drops close to zero. We started by prototyping a small circuit to measure the resistance of four pieces of bacterial cellulose. The circuit has 5.1 k resistors as reference resistance and the analog input pins of the arduino as the input device. The values of the resistors were determined by purely experimenting, while having the openFrameworks application, PulsumOSC by Leslie Garcia, running. This way we were able to get some permanent values. the hardware thus consisted of an arduino, a soldered circuit on a prototyping board and crocodile clamps for embedding the organic material. For the final prototype we replaced the crocodile clamps with glueing the wires onto the bacterial cellulose with pieces of the material itself. This way we were able to attain both a better usability and the simple aesthetics we wanted. The form of the user interface was to large extent dictated by the functionality of the pieces and easily formable rapid prototyping materials available. In the end we created three different pieces; a mask made out of EVA foam, a touch pad with a base made out of acrylic glass and a foldable piece with poly-propylene holder. Organum Vivum can be used for playing solo or as well as a part of an ensemble. By using various bacterial cellulose sensors (breath, touch, pressure) multiple digital instruments can be played simultaneously and a rich, evolving ambience can be created. This soundscape can then form a sound piece in itself or a fragment of a more complex composition consisting of other digital or even acoustic instruments. As a controller the piece itself doesn’t have acoustic or sonic qualities. Instead, the digital synthesisers which we created for the performance are inspired by bioacoustics; imitating properties of organic, periodic sound patterns like cat purring and cricket stridulation, mixed with crude sound synthesis. These segments come together as a minimal, medita- tive but animalistic layered soundscape with subtle changes, which spark connotations to both synthetic and organic, thus engineered organisms. The focus of the instrument lies on the material and on the idea of interspecies communication. Through moist and touch the bacterial cellulose interface is easily influenced but not entirely controllable. Due to the characteristics of an organic material the player cannot gain a total control over the system which brings the user and the instrument to a more equal position. This concept of control is also explored in Lose control, gain influence – Concepts for Metacontrol, de Campo (2014). Furthermore, the small size and the limited controllability of the objects bring the quality of presence of the performer in a vital position of performing with Organum Vivum. Like the changes in the soundscape and the response of the bacterium cellulose, the movements of the performer are clear, concentrated and subtle. Performing with Organum Vivum regards setting oneself to a sensitive state as a vital but not dominating part of an organism. After circling around biosynthesis related themes for a long time we were able to nar- row down the number of key factors, without losing the original area of interest. We man- aged to find our focus but work open minded with the material. The process stayed flexible as we made use of our research so far and found a way to apply sounds, originally creat- ed for other purposes, to the final work. In the end we succeeded as well in the defining of the final concept as in holding on to it in the actual performance, and were able to create a holistic, simplified and concentrated piece. A fluent teamwork made it possible to achieve a focused atmosphere and “a mutu- al state of mind” while both practising and performing. Due to spending a week at Musicmaker’s Hacklab at CTM Festival 2015 our work was influenced by a sound artist Leslie Garcia with whom we were able to discuss and share a ideas of themes related to working with microorganisms. During the festival we also got a valuable chance to present the project to a broader audience. to reduce it’s unexpectancy (e.g. solving the occasional problems of gaining no response at all). Performing with the original setup a simple improvement would be to get rid of the computer and the grounding plate and using some other kind of controller alongside Organum Vivum instead. On the other hand, because of the material knowledge we’ve gained so far and the scarce applications of it in the field of sound it would even be interesting to continue working on a creation and definition of a simple, intuitive user interfaces based on the prototypes. In addition the concept of touch pad could be developed further, for instance resulting to a interspecies midi controller. 3DMIN CONCERT #3 – Body, Space, Relation from 3DMIN on Vimeo. 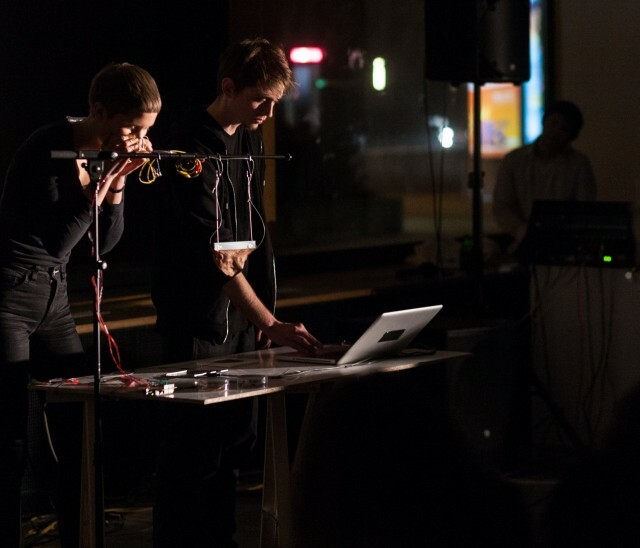 A concert of Music performances with experimental instruments, that were developed within the 3DMIN project between october 2014 and february 2015 at the University of Arts Berlin. The concert took place on 12.2.2015 at the Leap in Berlin as the third issue of the collaborative Lecture and Performance Series between 3DMIN and LEAP. 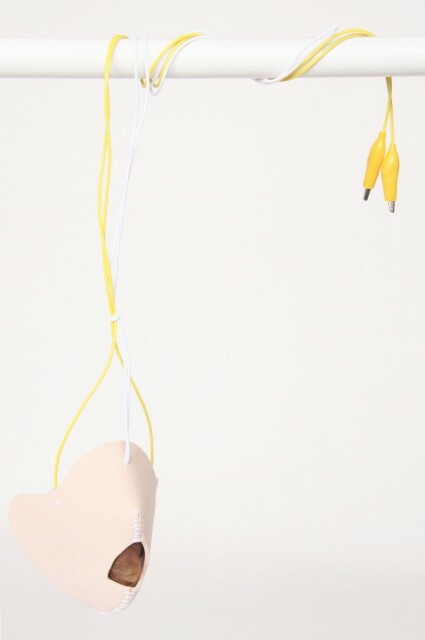 Four performances were shown, each featuring one or more instrument prototypes developed in the scope of the 3DMIN project, focusing the aspects Body, Space and Relation.